As a clinical nutritionist, I'm asked daily about nutrients. Calcium, vitamin A and vitamin D3 are typical topics for chameleon owners, with good reason because these nutrients are vital to life and well-being. As a clinical nutritionist, however, I know there is an even more important nutrient. Water. From source to acceptance to dosages, water is critical to chameleon health. If we don't get it right, water-related disorders kill chameleons faster than any other nutrient. Where does your chameleon water come from? When was the last time you had your water analyzed? If you water has a local source, what are the water problems typical for your area? Is your water hard or soft? Is it fluoridated? Do you use a water softener? Your water will contain a variety of minerals and who knows what else. If you're using well water, there may be contamination from feces, animal carcasses, farm herbicides, and toxic matter. Several years ago, we traced a water problem back to a rattlesnake that had fallen into our spring, drowned, and decayed. If you're using town/city water you likely are dealing with fluoride and chloride. 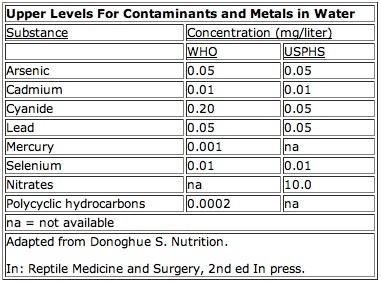 The water company will be testing for high levels of toxic minerals, and you should be able to access the reports. A quick on-line search will show you the problems, past and present, with commercial bottled water. As a chameleon keeper, it's your responsibility to know what you're providing. Water analyses are available from commercial laboratories and county extension offices. Hard water contains the bicarbonate and sulfate salts of calcium and magnesium. It is safe for reptiles. Softened water has calcium and magnesium replaced by sodium; it is a danger to patients on sodium-restricted diets. The role of sodium-containing softened water on bladder stones in reptiles hasn't been delineated yet, but high sodium intakes should be avoided if your chameleons have problems with the renal system, edema, or chronic stress. Calcium-containing bladder stones can be due to dietary excesses of vitamin D, vitamin C, calcium, sodium, phosphorus, or magnesium, ii) low water intake, iii) urine retention, iv) abnormalities in the excretion of calcium, sodium, or phosphorous, and v) altered pH (acidic for calcium oxalate, alkaline for calcium phosphate) for a variety of medical, endocrine and dietary reasons. Moreover, stress leads to increased release of stress hormones from pituitary and adrenal glands that in turn lead to excessive losses of potassium, phosphorus, calcium, magnesium and zinc. Retention of sodium and water follows, resulting in edema. In chameleons, mineral imbalances and water retention have not been described quantitatively. 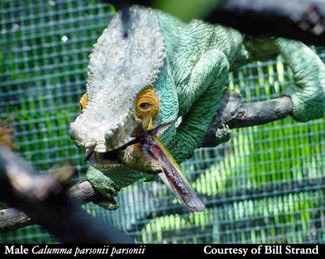 We know, however, that chameleons stress easily and that edema is common, especially in montane species. For this reason, carefully moderate and restrict sodium levels and aim for optimal intake of trace minerals. Demineralized and distilled waters have minerals removed; these types of water are not necessarily beneficial to reptiles. Fluoridated water contains 0.5 to 1.0 ppm fluoride, usually as the sodium salt. Fluoride has a narrow safety range. In mammals, deficiency is associated with dental caries and with osteoporosis in the aged. Fluoride toxicity (fluorosis), due to accumulation from long-term consumption of high levels, is associated with deformed bones and soft, mottled, and irregularly worn teeth. Animals fed diets deficient in protein, calcium, and vitamin C are more susceptible to fluorosis. Water sources containing high levels of fluoride are found in parts of Arkansas, California, South Carolina, and Texas and may be a risk for fluorosis. In reptiles, fluorosis can mimic the signs of metabolic bone disease (MBD). Water should be free of coliform bacteria. Until specific data for reptiles are available, data from the World Health Organization may be used as a guideline for water quality. Water may be chlorinated (to destroy bacteria) at home by adding 8 to 16 drops of bleach to 1 gallon (2 to 4 drops/L) of water. All chameleons need ample access to wholesome water. Acceptance of water, however, depends on several factors. Besides appropriate taste and odor, it appears that chameleons may need to see light reflectance from dripping water in order to begin drinking. Thus drip systems are needed to ensure adequate water intake, and adequate eyesight is needed to enable sighting of reflected light. Plastic containers for holding water should be approved for food use. Some plastic storage units may lead to rejection of water, presumably because of off-odors or taste. A switch to glass, ceramic, or stainless steel usually corrects the situation. Hypohydration and dehydration are commonly found in sick chameleons. Problems may result from water provided in improper form or inadequate amounts, or from poor appetite (termed anorexia and due to many factors); or disorders may occur secondary to the pathologic process of a disease. Uricotelic species such as chameleons require large amounts of water to sustain normal excretion, and dehydration in these species may result in urinary stasis, uricemia, and gout (more on this in a future column). A number of species have nasal salt glands for excretion of sodium and chloride in response to an osmotic load. White crusty deposits may be seen around the nares of chameleons as well as green iguanas and other lizards and are normal findings. Certain species also secrete potassium as well as sodium, and chloride or bicarbonate. The system helps to conserve water while ridding the body of excess minerals. Hypohydration - Hypohydration is the state of decreased water content in the body, often used to describe the state prior to the development of clinical signs of dehydration.. Cases in chameleons can be found pet shops, reptile shows, recent imports, and long-standing collections. Hypohydration should be considered whenever water balance has been threatened. Signs will be subtle if present, however any information in the history suggestive of impaired water balance should be treated with aggressive rehydration. Hypohydration is often unobserved until clinical signs of dehydration occur. Because reptile kidneys lack a structure termed the loop of Henle, urine cannot be concentrated when water intake is low or water loss high. Instead, complete kidney units - termed nephrons -- shut down in succession until water balance is restored. Urine is resorbed from the distal tubules (under control of vasotocin), cloaca, and bladder. The dynamics relate to many factors, including status of potassium and sodium, acid-base balance, metabolic rate, and corticosteroid (stress) levels. 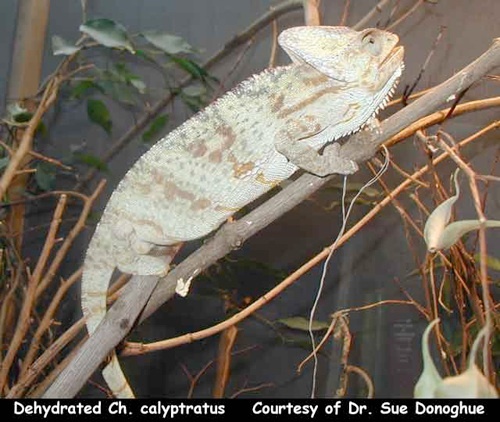 Dehydration - Chameleons become dehydrated for the same reasons as they become hypohydrated; the difference is one of degrees, clinical signs, and prognosis. Re-establishment of kidney (individual nephron) function depends on circulating corticosteroids (and other factors), and may fail in those chameleons suffering chronic stress. Less than optimal body temperature lowers metabolic rate, which in turn lowers glomerular filtration rate and inhibits re-establishment of functional glomeruli. Fast and accurate treatment of dehydration is thus critical. If oral fluids fail to correct the problem, intracoelomic or intraosseous fluids should be considered. Dehydrated reptiles exhibit sunken eyes, dry loose skinfolds, depression and anorexia (see figure). Photo Legend: Note the sunken eye in this severely dehydrated veiled chameleon. A look into his mouth would show stringy mucous and dry membranes. This chameleon became dehydrated secondary to a disease that prevented adequate drinking. Photo by the author. Water needs are based on metabolic rate (see my first column, March 2002). Once you have a weight on your chameleon, you can look up its metabolic rate from my charts. The charts give "calories per day". A useful approximation is that 1 (one) ml (cc) of water is needed for every calorie. If your chameleon needs, for example, 8 calories daily, it will be drinking about 8 ml daily. Another way to estimate water intake is to use an empirical equation of 10 to 30 ml/kg body weight. For rehydration by mouth, one can use drinking water in the above dose. Divide the daily dose into many small dosages administered about 2 hours apart. Risks of overdosage are very rare when using this method. If there is any suspicion of electrolyte losses (diarrhea, vomiting, poor food intake, disease), then a product such as Pedialyte is better than plain water. For severe dehydration, intraosseous (within-bone) catheters work well. These can be placed by your veterinarian. Your chameleon will require an overnight hospital stay while fluids are given. Another technique involves giving fluids into the coelomic cavity. All fluids should be warmed prior to dosing. Future columns will discuss water-related problems such as kidney disease and gout.